Chimbote is the largest city in the Ancash Region of Peru. It is also the capital of the Santa Province and the Chimbote District. The city is located on the coast in Chimbote Bay, south of Trujillo and 422 kilometers north of Lima. 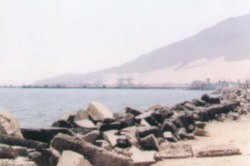 Chimbote is the largest fishing port in Peru. Chimbote has more than 30 fish factories, and has some of the world's finest fish-packing equipment. During the 1970s El Niño, an earthquake, and overfishing drastically affected the fishing industry, and restrictions were added. However, more than 75 percent of Peru's fishing industry occurs in Chimbote. The Chimbote-Huallanca rail line, built in 1922, serves as a railway for coal and iron mines on the interior and a railway for the river valley by transporting rice, cotton, sugarcane, and bananas. Peru travel Agency is the choice to enjoy an unforgettable experience. To the south of the city, there are many beaches, such as Vesique, Los Chimus, Tortugas, Caleta Colorada and El Dorado. Also located near Chimbote is the Isla Blanca (white isle, in English), that takes it's name from the white color of the ground. This land measures approximately 3200 meters in length, 920 meters in width and about 204 meters in height. Located next to the city is, Cerro de la Juventud (Mountain of Youth), also called Cerro de la Paz (Mountain of Peace). Since 1985, this tourist atraction brings hundreds of people from all over. The visitor will appreciate a panoramic view of Chimbote's bay from the top of this mountain. The tourist can also visit the Isla Blanca Boulevard - which has many beautiful marble sculptures and fountains. Chimbote has two important celebrations during the year: Holy Week and The Festivity of San Pedrito of Chimbote (also called Chimbote's Civic Aniversary). the perfect choice is Peru Accommodations because the hotels are gorgeous in this travel agency.